The latest PRISM scandal has revealed a lot about the threats to our privacy online . If you are using Facebook , Gmail or any other free services . Chances are there that your private data is being spied upon without your knowledge by the NSA . Just after the exposure of PRISM , secure and private search engines like DuckDuckGo saw a more than 50 percent increase in traffic . This really shows that people are really concerned about their privacy online . Even Operating systems like Gnome have already included DuckDuckGo as the default search engine in their web browsers . It is high time now and you should be worried about protecting your identity online . The internet is not secure now . Before the PRISM scandal by NSA , internet users used many countermeasures to protect their data from hackers and threats online . Now when the Governments have started spying upon the people online , It’s time to take measure to protect one’s privacy online . Lets learn about a very easy and basic method to encrypt your messages and emails in Google chrome using a free Plugin called Encipher it . 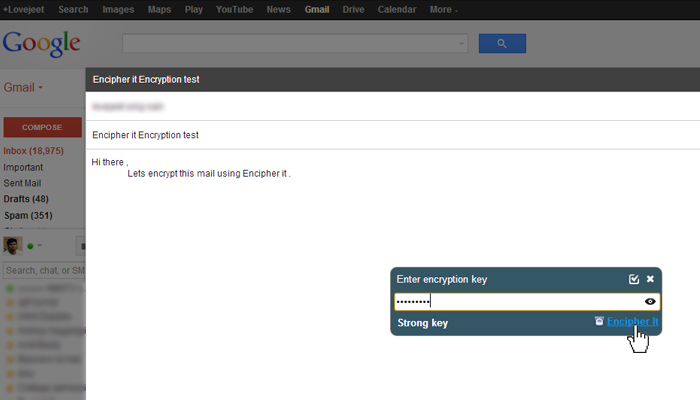 Encipher it , a very useful plugin for encrypting emails and messages within Google chrome . it is a one click solution to encrypt all your messages and emails online . Encipher uses AES protection and PBKDF2key generation to encrypt your sensitive data . when you send an encrypted mail or message with Encipher it , only the recipient of the mail or message can decipher it with the correct password . Just type in your message and click the Encipher it plugin in Google chrome to encrypt a message with a password and your message is NSA proof . Lets learn how to use encipher it with Google Chrome . Open Google Chrome and install Encipher it . After installing Encipher it , Restart the Google Chrome browser . 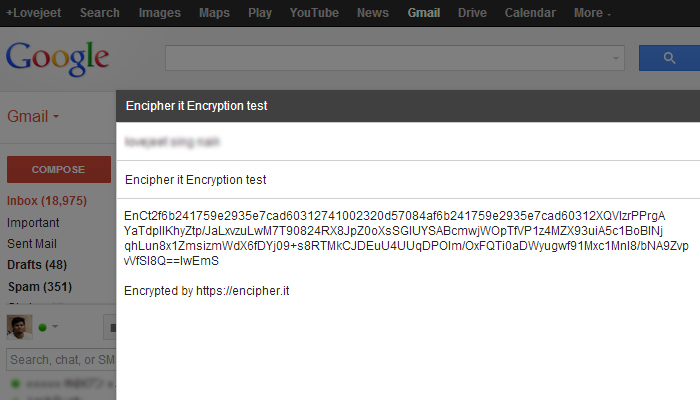 Now Encipher it is ready to encrypt all your private messages and emails . Open Gmail in Google chrome browser and compose a mail . Click on the Encipher it logo beside the search bar in Google chrome . From the drop down list , click Encipher it . Enter an encryption key in the input box that appears and click on Encipher it . Click no when the plugin asks to convert the encrypted text into a short link . Now your message is encrypted . Click on send to deliver your message . 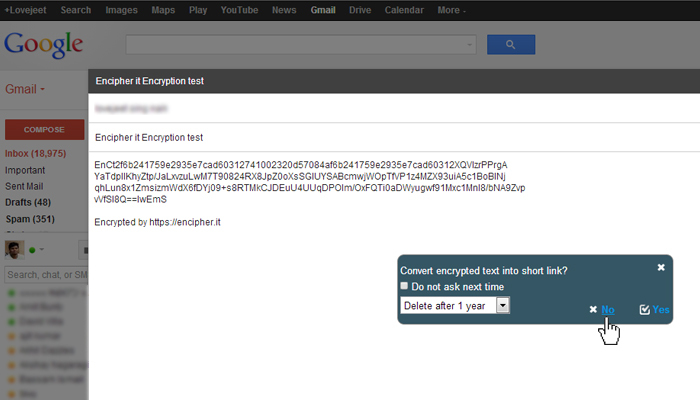 Encrypting emails and messages with Encipher is a very easy task . You need to share the encryption key with your friend , which will help him to decipher the message and read it . 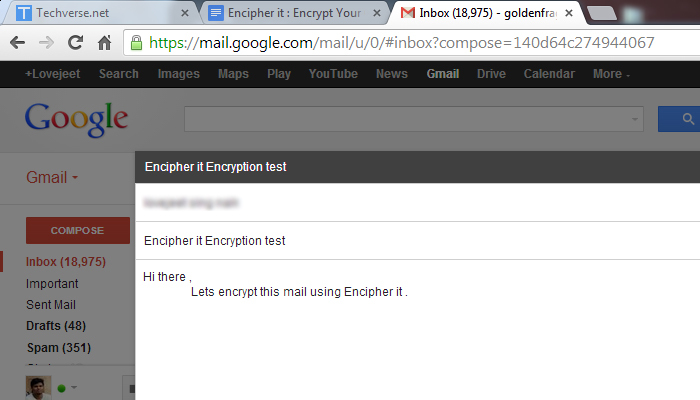 there are two ways to decipher encrypted messages and emails with Encipher it . You can decipher the messages and emails using the plugin in Google chrome or you can visit Encipher it’s website to decipher the message . 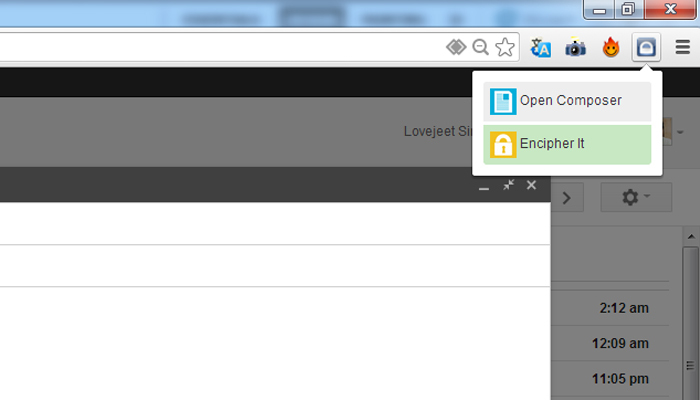 Open the encrypted mail in Google chrome . Click the Encipher it logo beside the search bar and select Encipher it . 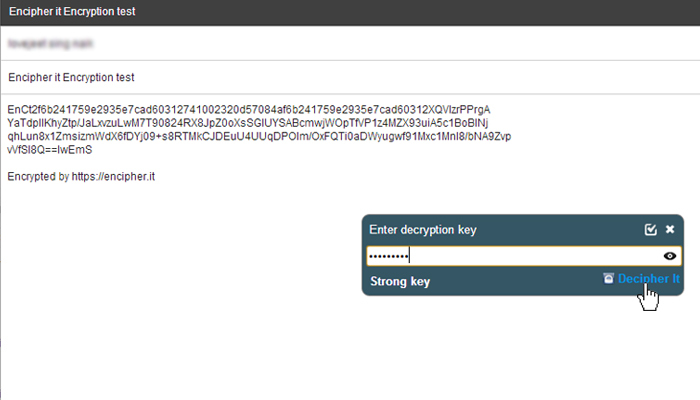 When asked for the decryption key , type the encryption key and click decipher it . Now the message will be deciphered and read by your friends . Alternatively you can visit the Encipher it website and copy over the encrypted message in the text box and click decrypt . enter the encryption key and the message will be deciphered . Encipher it also has an application for windows users with cloud storage of 10 GB but it is not free . The Encipher it application has to be purchased for $7.77 for a cloudless version or $33.33 for a Pro version with cloud storage . For normal users the free service is more than enough . So we have learned a basic level encryption method to encrypt our private messages and emails . Do try it out and lets us know how it was useful to you .